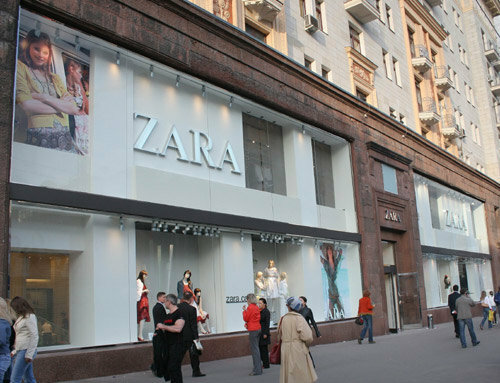 Madrid, 24 April, 2009 (AFP) – Special prices, reductions: Zara and the majority of other large Spanish clothing chains have started a ferocious price war in an attempt to redress falling sales figures in the current economic stagnation. Summer sales do not start until the end of June in Spain, but for a few weeks more and more shop windows have seen posters put up announcing reductions of up to 50%. That is the case for Sfera -opened by the leading department store in Spain, Corte Inglés – which hopes to compete with Zara in its ready-to-wear clothing shops aimed at the youth market. In the windows of Sfera’s boutique on the Gran Via in Madrid, in the centre of the city’s commercial centre, large and colourful stickers proclaim “-30%, stratospheric reductions, from 17 April to 30 April”. It is the same story a few metres away at Springfield, subsidiary of Cortefiel – the third ranked Spanish clothing chain – which has announced “-50% on all long-sleeved clothing, from 13 April to 27 April”. “These reductions make up a part of our strategy in light of the crisis. They are a kind of mid-season sale which have been very effective”, explained the director of Cortefiel, Ignacio Sierra, to AFP. “In times of crisis, reductions, promotions, work best to stimulate demand. They attract the attention of clients who feel like they are getting a bargain”, said Borja Oria, president of Acotex, the textile employers organization in Spain. These discounts are “perfectly legal” because they “only affect certain products and are for a short period”, he explained to AFP, assuring that they were not “hidden sales” outside the two legally scheduled periods, one at the beginning of the year and the other in the summer. Because the sector “like all the others, is affected by the crisis, with sales down 15% in the first quarter in comparison to last year according to provisional figures”, added Mr Oria. In his opinion, ready-to-wear brands are facing a double problem: “a lack of liquidity, the banks having turned the tap off on credit, and a decrease in consumption”, particularly accentuated in one of the countries most affected by the crisis, with unemployment passing 15%, the highest level in the Euro zone. “Thanks to the promotions, brands looking to sell products which have had a difficult time retailing, are not accumulating stock and are obtaining necessary liquidity to pay rents and employees' salaries”, explained Mr Oria. At Zara, leading brand for global giant Inditex, the strategy is more subtle: no posters, nothing crying out, but there is a new line, christened “Special Price”, which has slid onto rails discreetly in the last few weeks in its shops across the world. In the ladies’ wear section, multicoloured t-shirts for €7.90 mix with cotton shorts for €5.90. What’s special about these products? “They are less expensive”, a sales assistant replied mechanically in-store on the Gran Via. But “it is not a specific strategy” in response to the crisis, a representative of the Spanish group said defensively to AFP, “simply a new line for which we have carefully assessed the quality-price relationship, with products distinguished by the ‘Special Price’ label to guide the client”. And the war isn’t over yet. On the website of the clothing chain Blanco, customers can print coupons until the 30th of April, which are valid for a 10% discount on all clothes on sale.